I was first introduced to the world of mu shu as a working gal. My friends and I would order Chinese food for lunch and sit at the table in our boss' office (when he wasn't in) and have a feast. 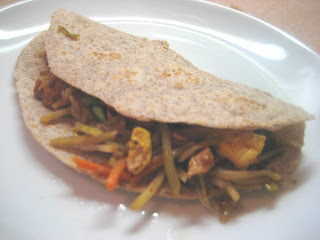 There I discovered the wonder of Mu Shu Chicken, the chinese taco. A mixture of chicken, cabbage, mushroom and egg that you spoon onto a pancake and embellish with hoisin sauce. It had some crunch and some sweet and I just loved it. Since then, my knowledge of asian cooking has increased 10-fold but I never considered making mu shu at home. Recipes called for exotic things like cloud's ear mushrooms, dried shrimp powder and some sort of needles that I didn't have the desire to seek out. But recently I ran across this recipe for Mu Shu Vegetables in the current issue of Eating Well magazine. It looked simple and the ingredients were handy. The recipe uses one of my favorite ingredients, broccoli slaw as a substantial part of the vegetable filling. And it also uses eggs, mung bean sprouts, green onions, garlic and ginger. The sauce ingredients are all common items that you might have if you stir-fry: hoisin sauce, rice vinegar, and soy sauce. Plus you need some flour or ww tortillas for your wrap. A tortilla approximates a mu shu wrap very well. I'm so excited to share this recipe with you because it is SO good and good for you too. You know you've got keeper when you're planning the next time you will make it while you're still eating it the first time. This dish comes together quickly and it tastes just like mu shu from a restaurant. Plus you don't have to go on a scavenger hunt in Chinatown to make it. And it reheats well to make a fantastic, savory lunch. I have one confession about the pictures included in the post. This mu shu has some chicken in it. I followed the recipe completely but when I added the slaw, I also added some thin sliced cooked chicken. I had some leftover chicken, and I thought it would make our dinner a little more substantial if I included it. You could also add some leftover pork (sliced matchstick style) if you happen to have it around. After all, the dish is classically mu shu pork to begin with. Some sliced mushrooms would also make a nice addition. Many versions of mu shu have mushrooms in them. I would add those when you add the garlic and ginger and let them cook a little before adding the rest of the veggies. But I promise you, the first time I made this recipe, I did it strictly with veggies and it is really good just that way. And you have protein from the egg so you really don't need the meat. Also one more thing, I halve this recipe and still have leftovers for the next day. You can use the rest of your bag of broccoli slaw on top of salads or as a salad itself. (See my link above for some ideas.) Or you could just save it to make some more mu shu later in the week ... 'cause you're going to want to. Serve with warm whole wheat or thin flour tortillas, Asian hot sauce and extra hoisin sauce if desired. Heat 1 tsp. oil in a large nonstick skillet over medium heat. Add eggs; cook, stirring gently until set, 2 to 3 minutes. Remove to plate. Wipe out the pan and heat the remaining 2 tsp oil over med heat. Add ginger and garlic and cook, stirring, until softened and fragrant, 1 minute. Add shredded vegetables, bean sprouts, half the sliced scallions, soy sauce and vinegar. Stir to combine. Cover and cook, stirring once or twice, until the vegetables are just tender, about 3 minutes. Add the reserved eggs and hoisin, cook, uncovered, stirring and breaking up the scrambled eggs. ( I prefer to break them up while they’re on the plate and the veggies are cooking) Cook for 1 to 2 minutes until everything is heated through. Stir in the remaining scallions, remove from heat and serve with warm tortillas with a shmear of hoisin under the veg filling. This recipe can be halved and it reheats well. If you were going to add cooked thin sliced meat, add it with the vegetables. Do the 14 grams of carbs include a tortilla or other wrapper, or id that just for the filling? Without the tortilla. I try to keep it to one tortilla per meal and load it up with veggie mix.